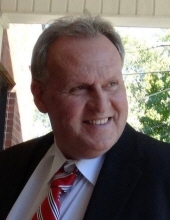 Raymond Carroll Humes, 58, husband to Kimberly Richards Humes, passed away Tuesday, December 4, 2018 in Lexington, Kentucky. He was born July 13, 1960 in Lexington, Kentucky to the late James and Nancy Sizemore Humes. He was a member of Safe Harbor Baptist Church and worked at United Bank. Raymond loved both UK basketball and football, and he was an avid reader. Along with his wife, Raymond is survived by his daughter, Casey (Michael) Yake of Georgetown, Kentucky, grandchildren, Xander Hafley, Caleb Yake, and Hayden Yake, brother, James (Regina) Humes and sister, Mary (Bob) Feezor, both of Lexington, Kentucky. Raymond is also survived by nieces and nephews, Kayla, Justin, Amber, & Chad, and 1 great niece & 2 great nephews, and his very special Father-In-Law & Mother-In-Law, Don & Liz Richards. To send flowers or a remembrance gift to the family of Raymond Carroll Humes, please visit our Tribute Store. "Email Address" would like to share the life celebration of Raymond Carroll Humes. Click on the "link" to go to share a favorite memory or leave a condolence message for the family.